Review: Eva shouldn’t exist, but she does. 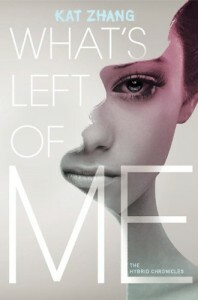 In a world where two souls get born into each body, and one fades after time, she’s the weaker one out of her and Addie. After faking through tests, Addie is declared dominant and Eva gone, but they both know she’s not. After meeting Hally and Devon, and finding a way for Eva to take control of their body, they try to take it. But then they get shipped off to another hospital, where they’re in more danger.Ever since I heard of this, I was really excited about this. It’s such an original idea and really interesting-sharing bodies with others, having to live like that, not having control over what your body does, and such. Then there was the whole persecution thing, and i was very happy at the differentness, the newness of this book.It didn’t take long to get the hang of Eva and Addie’s relationship. The whole, I love you but sometimes I dislike you, which you get from being around one person for a long time, so it’s easy to see that it was taken further when they’re together for the entirety of their life.I love the supporting characters. Hally and Devon are really cool. The romance between Eva and Devon and Ryan is really sweet, but a little annoying in places.Eva really takes the stage here, despite the fact that she is the weak one in her world. I love her voice, her determination to hang onto life with everything that she’s got, and her strength to keep fighting even though it would theoretically be best for her life to not.I’d like some more world building. There’s mentions of hybrids in other countries running around like normal, so I’d like to see why America thinks they’re a threat. I’d also like to see how they came about. The writing is good. It’s simple, but it gets across all the emotions really really well. There’s also little things like using me and us which show how they change their views about eachother.The whole concept really makes you think. What if it happened to me? What if a part of me was going to disappear one day? What if I was hated and threatened for not letting go of it? Then you realise exactly how scary this concept is.Finally, the amazingness of the cover. As in, there’s two girls in that one shape.Overall: Strength 4 tea to a beautifully original book. looking forwards to the next one.